Later this month, my friend/colleague, Le Putney of UNLV and I will be presenting on Vygotksy at the Conference on Academic Research in Education (CARE) Conference, which runs concurrently with EQRC and AABSS. 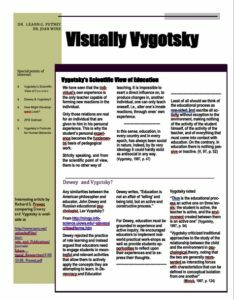 Through the years, we have often turned Vygotsky’s complex ideas into visuals and stories, and now newsletters. Our visuals begin on yellow legal pad, with us talking and drawing. Next, Le takes the ideas and draws them on her computers. In this WinkWorld, I will share some of the images, and then I will close with samples of the newsletters, which Le has created. 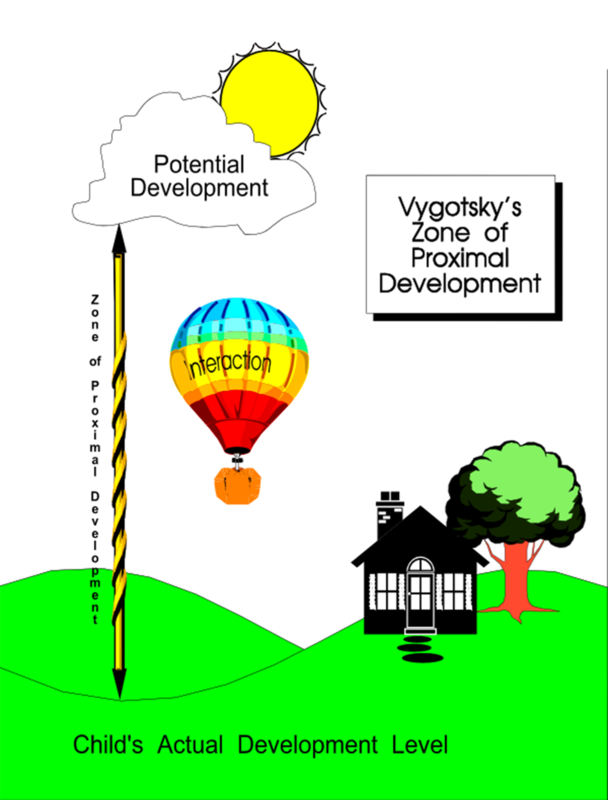 Vygotsky’s Three Principal Principles: (a) the dynamic and reciprocal interaction between thought and language; (b) the significance of the entire sociocultural context in teaching and learning; and (c) the zone of proximal development (ZPD), which explains how a teacher, mentor, mom, dad, caregiver (more capable peer) can pull a student up to a higher cognitive level through problem solving. “The Vygotskian perspective opened a door in my mind,” Kelly told her graduate classmates. 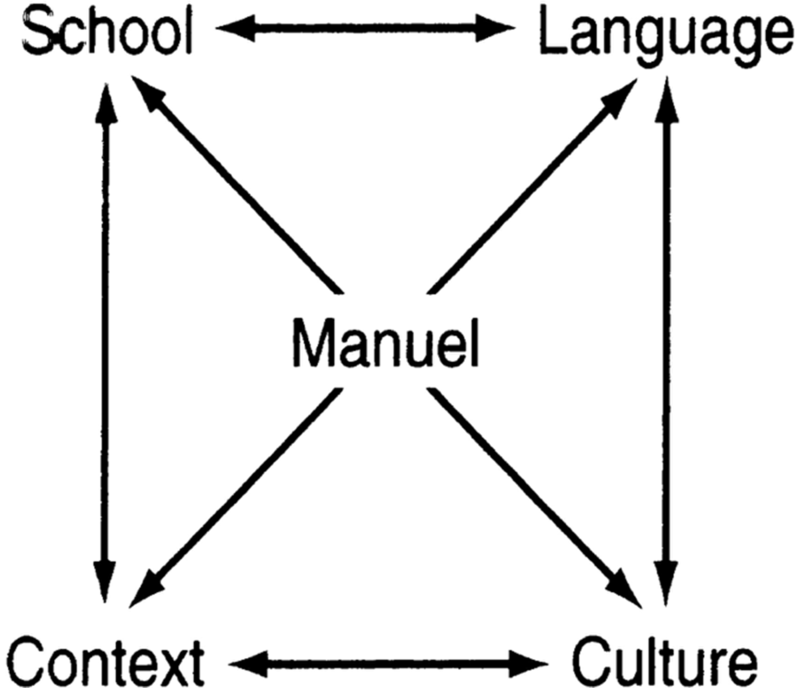 “For me, the three concepts are so intertwined that I can only discuss them as a whole. I tried to understand one at a time, and just when I thought I had it, and the dust was beginning to settle, a door would open beyond. I felt like Alice in Wonderland as I made my first journey through Vygotsky’s house” (Wink & Putney, 2002, p. 40). 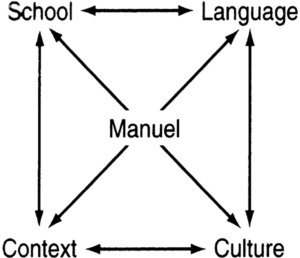 To cite: Language and Thought Dynamic. Wink & Putney, 2002, p. xxvi. “Thought is not merely expressed in words; it comes into existence through them. Every thought tends to connect something with something else, to establish a relation between things. 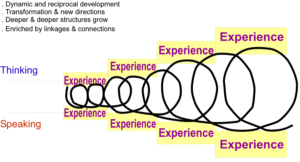 Every thought moves, grow, and develops, fulfills a function, solves a problem” (Vygotsky, 1986, p. 218). 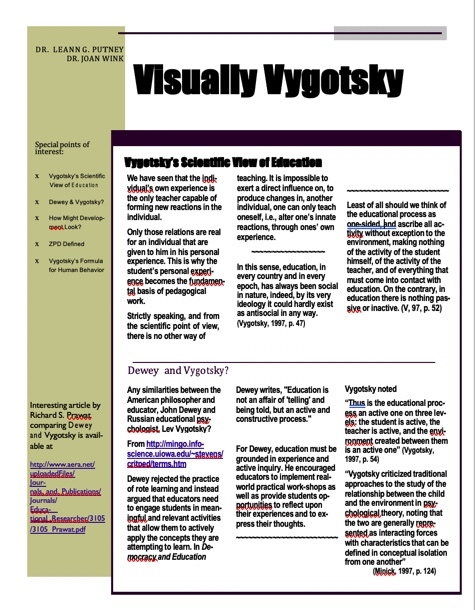 “Instruction, after all, does not begin in school” (Vygotsky, 1986, p. 208). To cite: Student in the Center. Wink & Putney, 2002, p. 75. “What a child can do in cooperation today he[she] can do alone tomorrow. 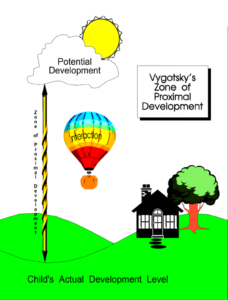 Therefore, the only good kind of instrction is that which marches ahead of development and leads it…” Vygotsky, 1986, p. 188. To cite: Hot Air Balloon. Wink & Putney, 2002, p. 88. 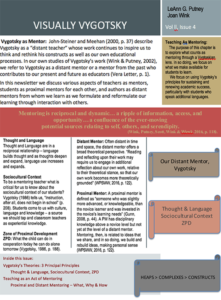 Le has now moved on to creating a series of newsletters for her classes at UNLV. Three examples of the first pages are posted below. During our CARE Conference presentation, she will be sharing the newsletters as examples of how teachers can create classroom newsletters for the students in their own classrooms. When I first met Le, she was a graduate student in one of my classes. At that time, I was her more capable peer in Vygotskian constructs. As you can see, Le is definitely my more capable peer in newsletter creation, but during the CARE Conference, she will pull me up through my zone to my next developmental level of creating newsletters. If you would like a copy of the handout for the participants, click on the PDF posted below here. 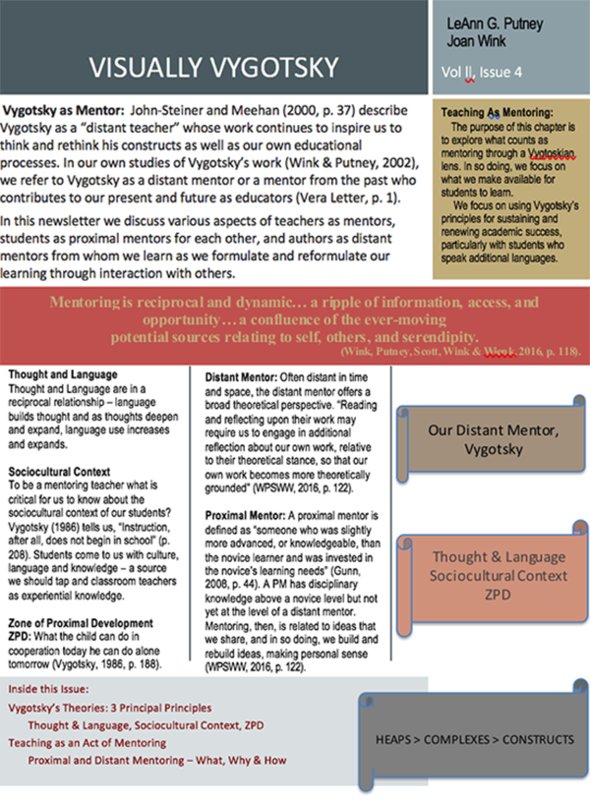 To view and/or buy one of our Vygotsky books, see below. 2002, first edition (gray foggy mountain cover): Usually sells for about $30 and the used copies begin at about $7. The eBook edition (tan cover/blue trim): Sells for about $13. 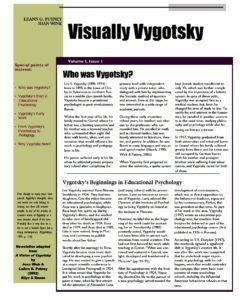 Click in the box below, and then you have to click on ALL BOOKS over on the right, red icon in order to get to the two Vygotsky books. Wink, J., & Putney, L. G. (2002). 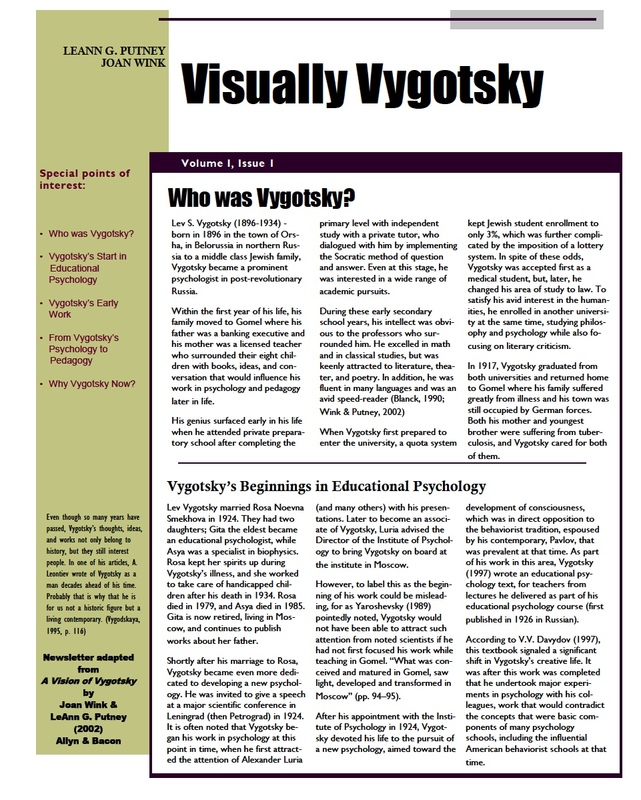 A vision of Vygotsky. Boston, MA: Allyn & Bacon, A Pearson Education Company. I have been following you since 2001 when I completed my MA at LMU. My expensive extensive education to complete all my requirements has been great providing me with a wonderful career. Sadly 5/31/18 I was forced to retire. I had a mystery illness and I am still being tested by my team of MDs. Now I am ready for next steps and deciding what I can do to make a difference. Hello Patti, thank you for your note, and I hope that your health improves. 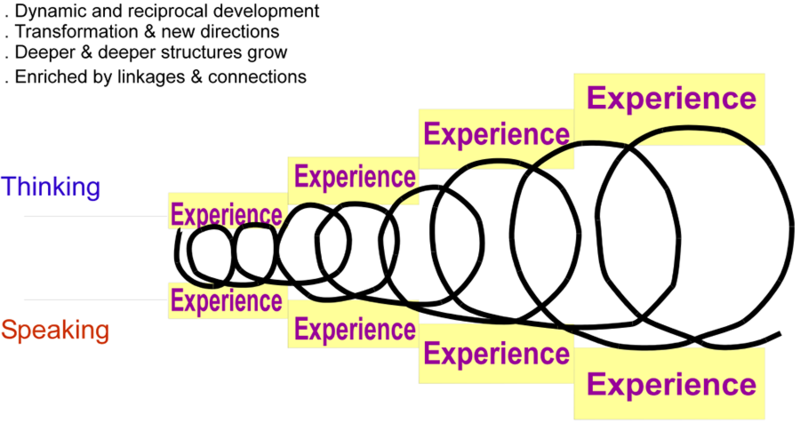 Without knowing you, your skills, your interests, your context, it is difficult to make suggestions specific to you. However, these ideas popped into my head: volunteer in schools and libraries near your home; take part in all of the local/state professional educational groups which interest you; read & summarize & share hot new research, which interests you; and start a blog. Other ideas, anyone? Thank you for the feed back I appreciate the communication with me.